Title: "SMOKING GUN" PROOF THAT ILLUMINATI PLAN TO ATTACK ON 9/11 AND BEYOND WAS WELL KNOWN AS FAR BACK AS 1995! 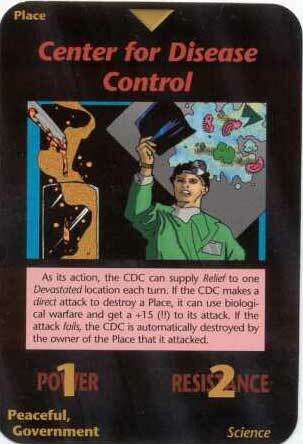 Part 1 - Future Cataclysmic Events Accurately Foretold In 1995 Illuminati Card Game -- 9/11 Attack Foreseen. "The Illuminati Is Fulfilling Biblical Prophecy"
"The Illuminati Protocols of Zion: The Plot Against Israel"
Subtitle: In nine pertinent playing cards of the "Illuminati New World Order" Game, how did the inventor know -- in 1995 -- the three events comprising the 9/11 attacks? How did he know also the correct plan in the near future? Why do his cards predict the appearance of Antichrist and the Rapture as the last two events of the Illuminati Plan? In 1990, role-playing inventor, Steve Jackson, was planning his newest game, which he would ultimately call the "Illuminati -- New World Order" Game, or "INWO" for short. Jackson was creating a game that would hit very, very close to home, very close to the actual plan of the Illuminati to propel the world into the New World Order -- also known as the Kingdom of Antichrist. As we shall show you, Jackson issued playing cards, three of which foretold the events of 9/11, three of which correctly predict future events just ahead of us, and two that correctly foretell the last two events that the Bible foretells will occur during the final birth pangs that will produce Antichrist! "On the morning of March 1,  without warning, a force of armed Secret Service agents - accompanied by Austin police and at least one civilian 'expert' from the phone company - occupied the offices of Steve Jackson Games and began to search for computer equipment. The home ... the writer of GURPS Cyberpunk, was also raided. A large amount of equipment was seized, including four computers, two laser printers, some loose hard disks and a great deal of assorted hardware. One of the computers was the one running the Illuminati BBS." The company, "S.J. Games" fought back in court and finally won, but nearly went under financially. The investigation zeroed in on "fraud" supposedly committed by the company regarding the hacker activity and the fact that the company promoted the hacker's newsletter, "Phrack". However, this is so flimsy that it makes no common sense; in fact, the affidavit made so little sense that a Judge threw the case out, awarding S.J. Games $50,000 plus $250,000 attorney's fees. That is a lot of taxpayer's money to pay for a stupid, nonsensical case! But, it does highlight the fact that our Illuminist government, the Secret Service then run by President George Bush (Sr.) was worried about something that S.J. Games was up to, and cooked up a reason to invade their offices and confiscate their materials. We think, after you review these materials, you will believe, as do I, that the real reason the Secret Service invaded S.J. Games was to shut them down so they could not produce the game "Illuminati -- New World Order (INWO), for it revealed too much of the plan that was still 11 years in the future. You be the judge. White Magic occultist, David Icke -- http://www.davidicke.net/symbolism/articles/dec2002/illuminaticards.jpg -- has pulled the most pertinent cards of this game out of the 100 cards the game contains; Icke selected these cards because they significantly tell the story of the Illuminati to produce the wars, the panics, the epidemics needed to produce Antichrist. This game was in the beginning stages in 1990 and was finally published in 1995, becoming a best seller. 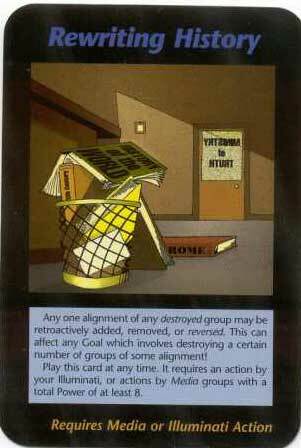 As Steve Jackson says on his website: "In 1994, he reworked the old faithful Illuminati to jump on the trading-card bandwagon. 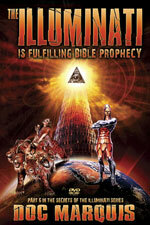 INWO (Illuminati: New World Order) became the company's biggest hit yet, and its first million-dollar ship." In fact, the "INWO" won the 1995 Origins Award for Best Card Game. 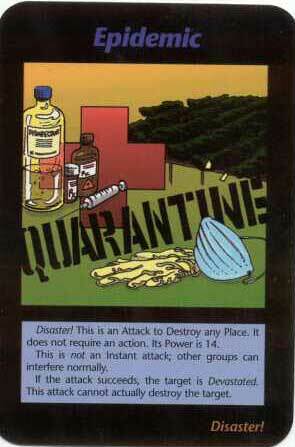 + The last two cards shown are in their correct sequence in the sequence in which David Icke has presented them. The Illuminati realized they had to deceive an entire population of people if they had any hope whatsoever of achieving their coveted New World Order. They realized that the public schools were graduating students who read too well, too widely, and communicated too well. These students generally distrusted Big Government and governmental authority. Clearly, the Illuminati had to gain control of the Public School system from the foundation upward if they had any hope of instituting a One World Government that would serve the New Age Masonic Christ. 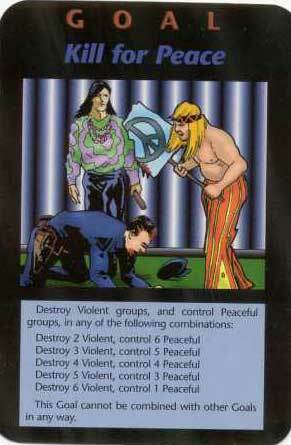 David Icke is correct in selecting this card and showing it first. Rewriting history was the first step in achieving the New World Order. * The caption at the top properly identifies the perpetrators of the attack as "terrorists"
"Pentagon" -- When I saw this card, immediately after seeing the Twin Tower picture, my blood froze! Unless one had advanced knowledge of the Illuminati Plan, there is no way on earth that they would have been able to create pictures in 1995 that accurately depict the unfolding events of 9/11! The Pentagon is shown on fire; we know that a plane allegedly flew into a section of the Pentagon and nearly burned that section completely. However, the rest of the Pentagon was undamaged to the point where its functions continued unimpeded. Isn't this the situation depicted here? 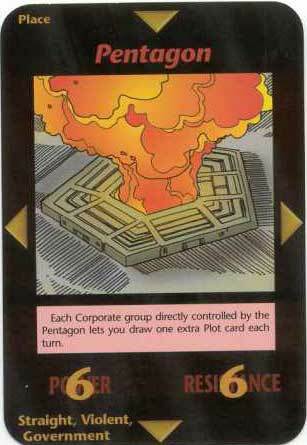 This card shows a fire burning mightily in the center courtyard of the Pentagon, but the rest of the building looks undamaged enough so that normal activities could continue unimpeded! * During the filming of the actual fire pouring forth from the Twin Towers, several cameras caught what seemed to be a demon face in the smoke. While most people were discounting this face as purely coincidental, two former Satanists called me within a couple of hours after those pictures were released, to tell me that those faces looked exactly like demons they had seen during a ritual when demons physically manifest themselves in this dimension. Cisco Wheeler further said that some of the most powerful demons in Satan's kingdom were known as Fire Demons; it was to these demons that the ancient peoples -- including Jews -- sacrificed their children to Molech. The appearance of these demon faces might be proof of what I have been saying -- that the attack was a Fire Ritual Sacrifice carried out by the Illuminati. This attack on the Twin Towers also was a perfect Satanic Fire Sacrifice, as we detail in NEWS1541. 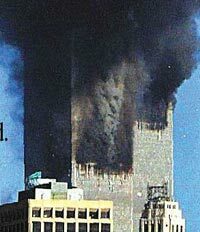 Many pictures abounded on 9/11 that showed a demon's face in the fire high up on the Twin Towers. This was not a coincidental phenomenon. * The fact that this card shows a demon face in the smoke of the Twin Towers in 1995 demonstrates that the Illuminati planned to make the Twin Towers a Fire Sacrifice that would call up Fire Demons. This card predicted it, and the demons manifested themselves through the fire. 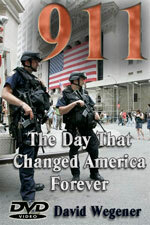 Just as Waco and Oklahoma City were fire sacrifices, so was the attack on the Twin Towers. * This card depicts a symbolic connection between the attack on the Twin Towers in New York City with the global plan of the Illuminati to effect a dramatic change in population! What possible connection could there be? 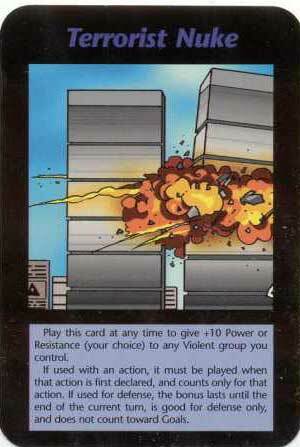 This card may be telling us that the 9/11 attacks on the World Trade Center Twin Towers is the opening blow in the campaign to dramatically reduce global population. 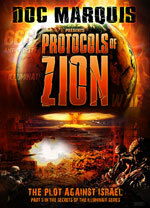 We know already that the 9/11 attack was the opening blow to begin the final "birth pangs" stage to allow Antichrist to appear on the world scene, as he strides out of the smoke, dust, and debris of World War III. Now, this card seems to be telling us that the attack on the Twin Towers is the opening salvo in the final stage of population reduction. Since the goal is to dramatically reduce population by four billion people, exactly the level predicted in the Book of Revelation, we should not be too surprised to learn that the judgments foretold of the Fourth Seal are now on the horizon, and in your Daily News. What are these judgments? 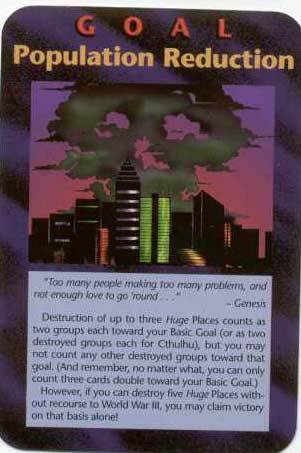 "Combined Disasters" -- Once again, how did this inventor of role-playing games know that, in addition to planned attacks on 9/11, and infectious diseases, the Illuminati has a myriad of other planned disasters that, when combined, they will so panic the peoples of the world that they will allow their liberties to be taken away and their freely elected governments to be abolished? What did Jesus predict? 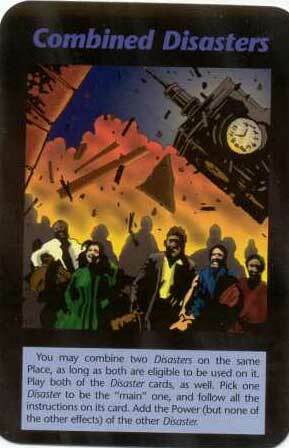 What are the types of planned disasters the Illuminati has planned in combination? Middle East with Iraq attack the likely trigger. Will China come to the aid of Saddam by triggering wars elsewhere? "Goal: Kill For Peace" -- How did this inventor know to connect the appearance of Antichrist with the phrase, "Kill For Peace"? The Broken Cross is a symbol of Antichrist [Read NEWS1710 for full details], and of the Witchcraft he will practice. Therefore, this symbol means that the appearance of Antichrist is tied in with the seemingly paradoxical goal of achieving peace. But, God foretold this would happen, did he not? Thus, this card accurately depicts this prophecy! This picture ties in the symbolism of the Witchcraft inherent in the Broken Cross with the establishment of a "peace". Further, note that the hippie is finally getting his dream of overthrowing the establishment! The police officer in his uniform is on his hands and knees in front of the hippies, in a pose signifying he has been beaten. The ultimate goal of the Illuminati in the 1960's was to pay and encourage the counter-culture hippie movement in order to change attitudes and values of the youth so dramatically that, one day, the entire establishment structure would be overthrown. Hippie Abby Hoffman exclaimed about the Rockefellers who were funding him, "The establishment is buying a revolution!" Now, the fulfillment of this old dream seems to be almost at hand. A violent overthrow of the Old World Order -- symbolized by the fallen policeman -- is absolutely required before the New World Order can be established. * Occultists are also looking forward to the Rapture, having been alerted by their Guiding Spirits that such an event would occur! Beginning in 1987, 'Guiding Spirits' of key New World Order leaders began to inform these human leaders to start preparing their adherents for a spectacular global event, that would occur just after The New Age Christ [Antichrist] will make his appearance. What was this spectacular event to be? As these 'Guiding Spirits' explained, when The Christ appears, there will be many people throughout the world that could never accept his views or his teachings. These people would prove to be a great obstacle in the way the New Age Christ wanted to move the peoples of the world. Therefore, the 'Masters of the Logos' had decided, these 'Guiding Spirits' said, to suddenly snap these people into another dimension, soon after The Christ arose. These recalcitrant people would be retrained in spirit, so that, when they reenter the 'Reincarnation Cycle', they will be fully persuaded as to the merits of the New World Order. Of course, when these people get back to earth in reincarnated bodies, the New World Order will have been in full swing for several hundred years, and everyone will know then how wonderful the system of The Christ is! On August 18, 1991, I was sneaked into a major seminar of the Boston House of Theosophy and heard with my own ears a very logical explanation as to why so many people were going to be suddenly snatched out of this dimension [Read NEWS1052]. 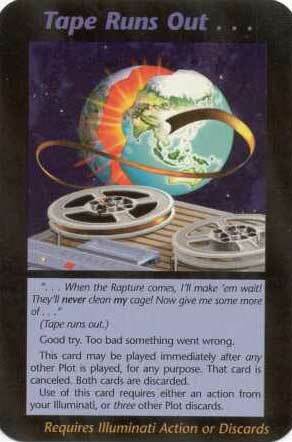 The fact that the Rapture card is depicted in this deck of playing cards for this game, and arranged last in order by White Magic practitioner, David Icke, speaks volumes about the fact that, in 1995, Steve Jackson knew the entire plan of the Illuminati. They know that, after Antichrist arises, tens of millions of people worldwide are going to be taken in the Rapture; the Illuminati has already spun the lie that will explain this event to their followers. 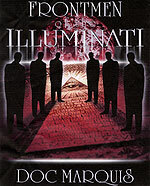 This role-playing game called the "Illuminati -- New World Order", or "INWO" is smoking gun proof that the Illuminati plan to produce Antichrist was well known in certain circles in 1995, when the game was distributed. Too many details are presented by these cards too close to the actual event to be accidental. The game depicts the events of 9/11 quite accurately and it depicts the planned events of bio-terror that are filling our daily news. If ever you doubted that a global conspiracy could or did exist, you can doubt no longer. This game demonstrates both the existence of the conspiracy and its main details. Suddenly, I get a feeling of the immediacy of the eternal, don't you?